Hello dear GISH PICKS reader! Summer is on my mind – and hopefully on yours, as it creeps closer and closer. This means it’s time to figure out where to send our kids for day camp fun! 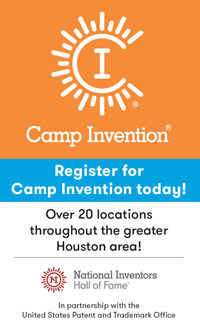 Check out THE SUMMER BOOK® ONLINE – my summer day camp guide that’s at an easy-to-remember website: www.DayCampsHouston.com. There are over 200 camps to choose from so there’s at least one camp that’s perfect for every child! 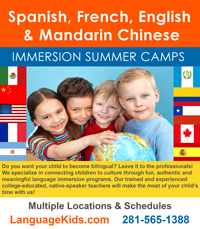 You can find camps by age group, area of town, subject matter, and much more! It’s so easy, you’ll love it. Best of all, you can search from anywhere – the carpool line, at work (shhh! ), and while at the beach. Is someone in your home running around dressed up like a knight or princess? Or how about performing drum solos on your pots and pans? Is their imagination overflowing with characters and stories? It may be time to sign up your growing young actor for the Alley Theatre’s Play Makers camps! There are spring break and summer options – both in Houston and Fort Bend/Klein. Play Makers participants join their peers for a full rotation of group activities designed to help even the most timid child find the confidence to step onto the stage. 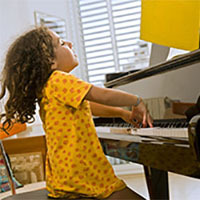 Alley Master Teaching Artists guide fun and informative lessons that teach theatre skills in improvisation, dance and movement, visual story-telling, and character development. Young creative masterminds will learn performance skills here that they will use their whole lives. COST: half day - $145/member and $190/non-member; full day - $275/member and $340/non-member; after care - $60/member and $75/non-member. The week of July 4th will be prorated. 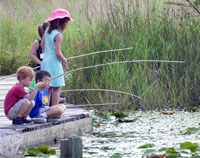 Send your kids to the Houston Arboretum for a summer of outdoor fun! They’ll learn about the Arboretum's forests in “Forest Ranges,” play outside during “Fun in the Sun,” get to know Houston's local wildlife in “City Critters,” see how nature inspires inventions in “Nature's Inventors,” or find out all about Houston's endangered species in “Going, Going, Gone?”. They can't wait to see your kids at the Arboretum this summer!